Don’t like the new Google Reader? To be honest, I’ve always hated Google Reader, so the current round of complaints since the update have had no impact on my RSS reading habits. One quick look tells me that the interface is more palatable, having adopted the new Google look common to it’s other product upgrades. 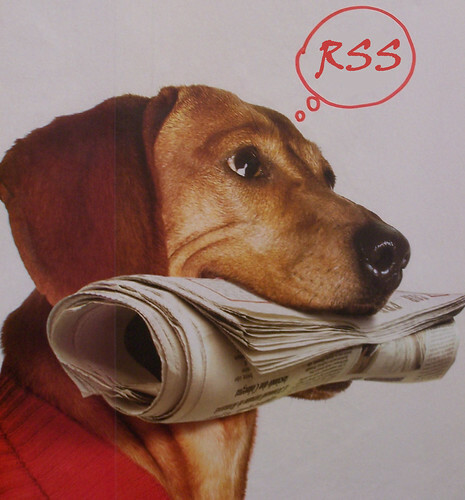 However, my RSS reads also tell me that many are unhappy, and that one of the key issues is the social interface. 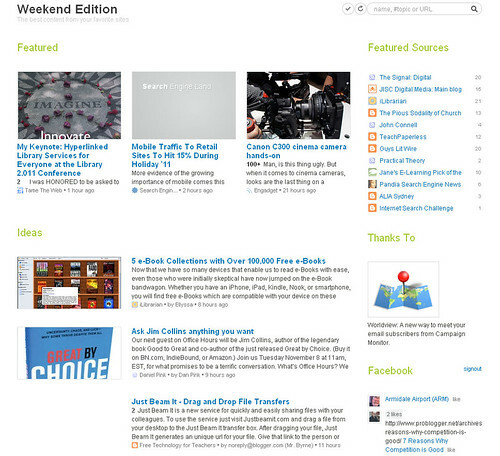 Google Reader’s redesign removes social features to other websites. The Google Reader team has prepared for the release to be unpopular with some users in the userbase saying in a preemptive post “we recognize, however, that some of you may feel like the product is no longer for you” adding that they extended the amount of exportable data. “Starting today we’ll be turning off friending, following, shared items and comments in favor of similar Google+ functionality” and iterated “we hope you’ll like the new Reader (and Google+) as much as we do, but we understand that some of you may not. Retiring Reader’s sharing features wasn’t a decision that we made lightly, but in the end, it helps us focus on fewer areas, and build an even better experience across all of Google”. Google Reader is certainly changing. In truth I am not at all ‘qualified’ to comment on the current iteration of Reader. Why? I’m been a long time fan and user of Feedly. If you’ve been around in any of my presentations, you’ll know that I like Feedly so much that I recommend it all the time. If you currently manage all your feeds in Google Reader, Feedly is a nice way to transition to a different style of feed reader. Feedly syncs with your Google Reader account, but uses a more magazine-style interface. The minimalist interface thankfully doesn’t put as much emphasis on whitespace as the new Google Reader, either. The service offers support for a plethora of social media services, but doesn’t include any built-in substitute for Google Reader’s social features. As an added bonus, there are also various mobile and tablet apps for Feedly which work nicely now. However, when it comes to my iPhone I also have a friendly relationship with FeedlerPro! THINK Global School is a travelling, international highschool which opened in September 2010. The current group of 15 students and their teachers don’t have a physical school building, but move every 90 days to another city somewhere in the world. They study via the local museums and other cultural organisations in an anyplace, anytime classroom organised around their learning tools – an iPhone, iPad and Macbook ProImagine. Think Global is about doing schooling in 12 countries in 12 trimesters. Takes a lot of dollars, but what a great chance for some. Do parents get to go along? Wow! I have to say, the claims about Opera Mini – are – pretty genuine! At last, I can browse/jump around websites as fast on my iPhone as I do on my main computer. Plus it has lots of extra features and nice navigation options! Should be very cool on the iPad. I have added Opera to my bottom navigation bar – bye bye Safari! If you haven’t already downloaded the App – race on over to the App store and grab your new browser experience. I’m sure there’s a bigger list somewhere ~ but it’s handy to have this Scrib document from James Greenwood. Perhaps you have another source to share? Right now I am in the run-up to the first exams of the year for my students. They’re getting nervous and I am too, while I gather my information, think about reports, and wonder how much information I can muster for the chats to parents that are coming up on Sunday. Sitting at my desk with dreamy eyes I wondered when I would be able to more effectively streamline my information gathering, my classroom tracking, and various elements of the administrivia of teaching that must be done to support great learning. I was on the verge of setting up something vaguely flexible for myself, using something online (google docs? ), so that I could develop this information in class (on a netbook?) and access it at my desk or at home. I had not worked out what to do! Bingo – I don’t need to. A read of my RSS news told me that a new product that will launch on the iPhone just might be a great place to start with all this. Educate: The Ultimate iPhone and iTouch App for Teachers. Plan lessons; monitor student attendance; with teaching and e-learning goodies too! They’re all talking about it, and being a Teacher Librarian, I have to take notice! For the last four years, Google has been digitizing millions of books, including many covered by copyright, from the collections of major research libraries, and making the texts searchable online. There are lots of wonderful resources available at Google Books. Robert Darton wrote a compelling reflection on Google and the Future of Books – what the impact of all this digitisation might be (apart from settled lawsuits), including ways in which libraries might more readily their literature and knowledge repositories with a global audience. Google’s mission is to organize the world’s information and make it universally accessible and useful. Today, together with the authors, publishers, and libraries, we have been able to make a great leap in this endeavor,” said Sergey Brin, co-founder & president of technology at Google. “While this agreement is a real win-win for all of us, the real victors are all the readers. The tremendous wealth of knowledge that lies within the books of the world will now be at their fingertips. What I do know is that we have to keep our boys connected with reading, research, knowledge, authoritative resources, and more and they need to know the best ways to have this at their fingertips. 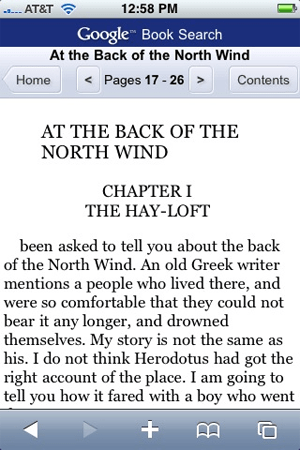 I have eReader and Stanza on my iPhone. There are many more! What is different about Google Books is the ease of being able to search and pull down material from such a vast collection. So in a school like mine, where many boys have an iTouch or an iPhone (even without program calling for these tools) the arrival of readily accessible classic literature on their devices is something to take note of. If you ever get a craving for classic literature while on the go, Google’s just given you the ability to check out your favorite literary works via an iPhone or Android phone. Google’s Book Search currently features 1.5 million public domain books, which have all been optimized to fit a mobile screen. Unfortunately, Blackberrys and other non-Android operating system phones are out of luck in accessing this feature. Google is using an extraction technology called Optical Character Recognition (OCR), that captures and formats the text from the page so that it can be easily viewed on a mobile browser. Circulate this information to your English staff!